Every year in the United States, we citizens celebrate Independence Day on July 4. On this day in 1776, members of the Continental Congress signed and enacted the United States of America’s Declaration of Independence from British Empire rule. At the time, there were just 13 states, and those states pulled away from Great Britain as a sign of freedom, independence, and democracy. Most Americans look forward to this day every year because of the parades, picnicking, eating their favorite foods, and of course, must-see fireworks displays. We gorge ourselves on food when what we need instead is a healthy serving of appreciation for what independence truly means. For me, independence is one of my top core values. I love my independence as a woman, a second generation American, an entrepreneur, a community volunteer, and a creative spirit. I am also an independent thinker. 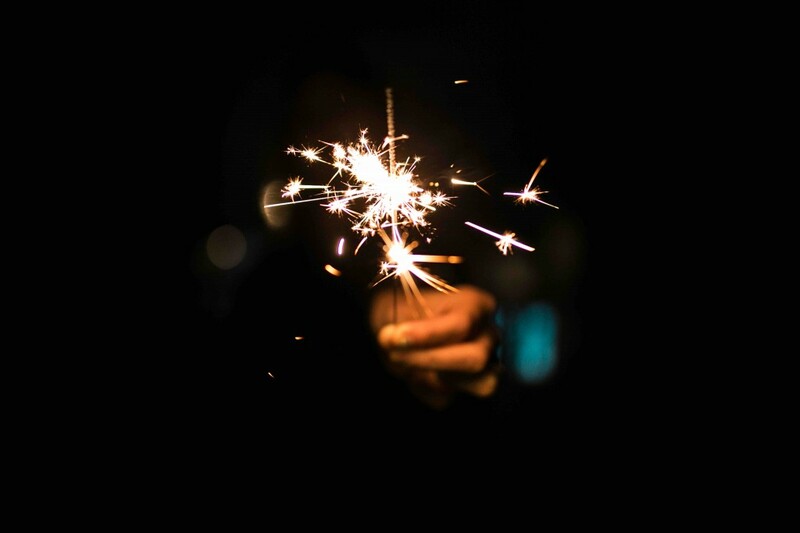 When my parents took my older siblings and me to watch the fireworks display or ignite our own sparklers in our front yard on the Fourth of July, I had no idea what we were celebrating. Growing up, I just knew it was a lot of fun. Now that I’m older, I value my independence even more. With that independence also comes responsibility. I can choose to work where I want, live where I want, be friends with whomever I wish, come and go as I please, support whatever causes I want, share my voice, express myself, and live my life as fully as I can. Take any of this away from me, and I am diminished. I feel less than. Not every person enjoys the same sense of independence as I do. I would love to see that change so that all Americans felt safe in sharing their voices, without ridicule or disrespect. Every American deserves the right to benefit from America’s Founding Documents, The Declaration of Independence, The Constitution, and The Bill of Rights. We need to do better. In our workplaces and in our communities, we must value each other’s choices and voices. We must continue to fight for equality and what is right and just for all people. As you gather around the campfire or picnic table today, ask yourself, “What do I value the most about my independence?” Be grateful that you live in a country that allows you to be independent. Appreciate it and value it for what it is today. Beyond offering leadership academies, mentoring, and coaching, more companies are choosing to engage employees in a more meaningful, personal way by offering Volunteer Time Off (VTO). I am a firm believer in volunteerism and how it enhances professionals’ skills. What is unique about VTO is that employees are paid while working on important local, national, or global community projects, learn from the experience, and hopefully apply that learning at work. Outdoor gear specialist Patagonia offers employees a variety of VTO opportunities, and sales leader salesforce.org offers its employees seven paid VTO days each year. Deeper level of connection. Service to others sets aside the ego because your number one goal is to help others. Many companies require employees to remain “unplugged” from technology while participating in VTO. No quick sales calls. No checking in with the office. The whole point of the experience is to engage fully in the work to be done. Present moment awareness. When you are volunteering for others, you are most concerned with handling the task at hand, no matter what it is. Whether helping to build a Habitat for Humanity home in an aging urban city or bring fresh water to a small village in Africa, you are most mindful of what you are doing from moment to moment. Expanded worldview. When you see the world from an entirely different perspective while living among people whose cultures and way of life are completely opposite from yours, it shifts your worldview. Some say the experience is as if someone removed a film from their eyes so they could see more clearly. Transformation. Beyond an expanded worldview can come a complete transformation of mind, body, and spirit. Acts of kindness build character. You may see a slight change in yourself, or you may see a different person emerging after a VTO experience. Better employees. When you learn something new every day, use different creative thinking or problem solving skills, and lead, or even follow, you return to your company as a better employee. You gain much more from an offsite cultural exchange than you ever could experience within an office environment. Shared, supportive values. Companies that offer VTO to its employees share positive values with employees, like compassion, kindness, generosity, and creativity. When you work for a company that practices social responsibility, you just feel good when you come to the office every day. How could a Volunteer Time Off program benefit your company and its employees? Think small, dream big. Within the nooks and crannies of communities are smaller, lesser known nonprofit organizations that achieve great things for the underserved, usually because the organizations don’t have as much overhead. Do some research and find those organizations in your community. Give a little. If your funds are tight this year and you don’t have as much to give, then give a dollar or two. Do you realize that you can feed one hungry person an entire meal for about a dollar? Volunteer. Beyond financial donations, charitable organizations benefit from hands-on help from ordinary people like you and me. Tasks can include serving meals, delivering food baskets, cleaning up properties, teaching people to read, or visiting the elderly. Organizations like Volunteer Match offer volunteer opportunities in more than 100,000 communities worldwide. Let others inspire you. If you need to be inspired to volunteer, then review this year’s CNN Heroes list for consideration. 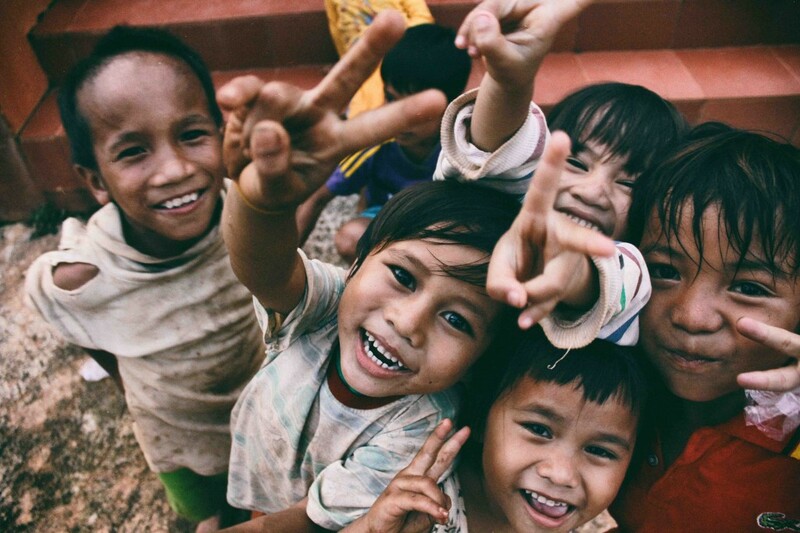 The stories of unconditional love and a passion to serve will inspire you. Be a positive role model. If you have children in your household, in your neighborhood, or in your workplace, teach them to care about others at an early age. Let them see you in action volunteering and helping others who may be less fortunate. Seeing is believing. You will inspire them to serve. How are you celebrating Giving Tuesday? What one thing can you do to help others? Get up-to-the-minute news posts by following Giving Tuesday on Twitter at @GivingTues. Saturday, October 28, 2017, is Make A Difference Day. 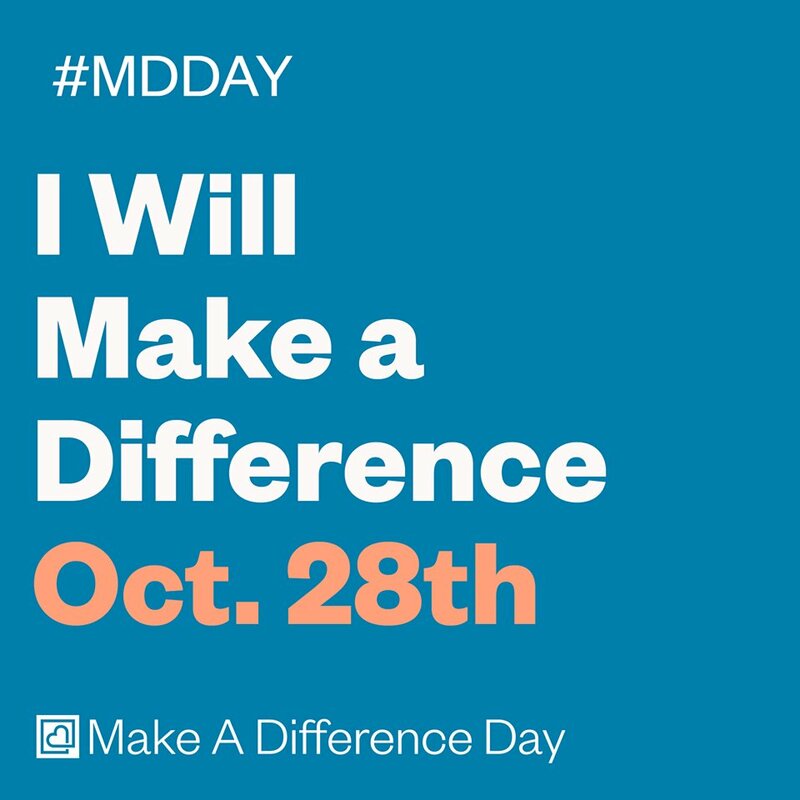 Twitter: #MDDay. This event is one of the largest single days of service across the country. Projects range from cleaning up public parks and building homes to serving meals to the needy. The annual event began in 1992, sponsored by TEGNA, Inc. with the support of Arby’s Foundation and Points of Light. You can either start a project or volunteer for a project that is already organized. Find a project in your community here from the Make A Difference website. 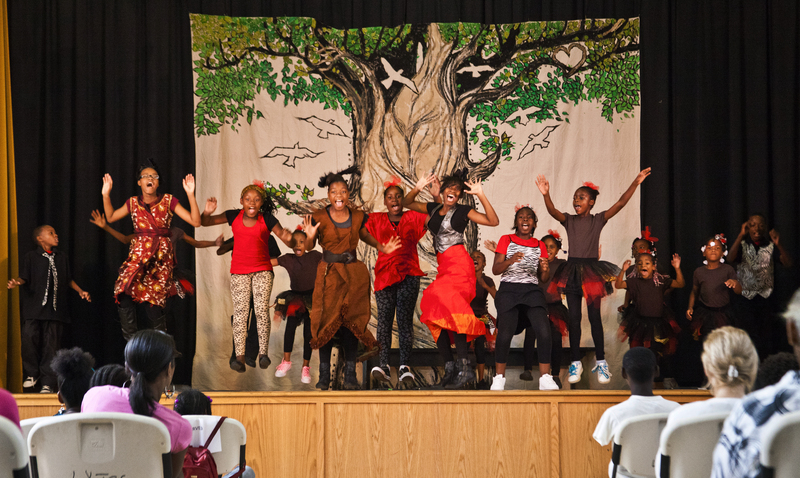 When I searched for events in my zip code, I discovered 20 projects that are happening in my area, from park clean-up and reading to underprivileged children to building an inner-city garden hoop house and knitting warm scarves and mittens for the homeless. Also, check your local television stations, radio stations, public libraries, schools, park systems, or nonprofit organizations to find projects right in your community. Or if you are feeling ambitious and want to travel out-of-state, participate in a larger scale project or historic site preservation. You will feel inspired when you read the stories about the 2016 project awards. Beyond this one national day of service, consider simple things that you can do to be of service to others every day. At the end of the day today, take a few minutes to pause and reflect on what difference you have made – in the lives of people who you have touched or in your community. When you invest that time in assessing your impact on the world around you, you will value and appreciate your many contributions. You will feel great pride in what you do. You will inspire and motivate others to do more. First, it begins with you. Take care of yourself and your health so that you can continue your good work. What did you do for yourself today that made you feel good about yourself? Did you start your day with nutritious food? Did you walk a few laps around your neighborhood to improve your stamina? What did you do for others today that brought you joy? It could be something simple like packing a note in your child’s lunch, or involving a neighborhood in creating a delicious meal together. Did you open the door for a disabled person at the office? Did you help an elderly person carry her food tray to her table? Did you stop and visit a friend or relative who lives alone and enjoys your companionship? Did you give someone a chance to lead others because you believe in that person? What did you do for your community today that made a difference? Did you bring your talents to a nonprofit organization’s board? Did you help to make an important decision that will have a positive impact on your community? Did you volunteer at a local fundraising event? Did you help build a home for a family in need? If you want to invest more time in making a difference, then focus on that outcome. When you choose to do more for others, to make someone else’s life more comfortable, or to make your community a better place, the opportunities will come to you. You can also bring your own big ideas into fruition. Anything is possible when you have a strong desire to make positive change a habit. From crisis comes lessons learned…hopefully. The recent devastation in Texas, Florida, and the U.S. territory of Puerto Rico caused by Hurricanes Harvey, Irma, and Maria, left thousands of homes and businesses destroyed, people displaced from their homes, in desperate need of basic essentials like shelter, food, and water, and sadly, lives were lost. When you know a crisis situation is coming, you have some time to prepare a communication plan. Authorities had learned from Hurricane Katrina, Hurricane Sandy, and others in recent years. When you apply lessons learned, tweak and adapt along the way, then you have a solid communication strategy. With each repeat event, more is learned about what needed to be communicated and when. What will you do when crisis strikes? Here are a few important reminders when communicating catastrophic events. Send Clear Messages. Keep your message clear and simple, and repeat, repeat, repeat. The anticipated devastation and flooding levels in each of these hurricanes reached the public days in advance through meteorologists, the media, FEMA, government leaders, social media, and in-person efforts. The messaging for protection against the elements and evacuation when recommended needs to be clear. Be Calm Yet Emphatic. When you are the lead spokesperson during a crisis, people look to you for a calming presence. You provide stability and hope. Authorities remained calm yet serious when communicating with residents who were in the path of the hurricane. Use Multiple Channels. Don’t rely on one communication channel…use all of them. From the most sophisticated electronic communication to the old-fashioned person-to-person, look to all communication channels to assist you in getting your message to the public. Prioritize Safety and Security. The Number One concern in times of disaster is the safety and security of residents. Agencies were prepared for tens of thousands of residents who were displaced in the hardest hit areas of Texas and Florida. Yet, communication took much longer to reach those in more remote areas of Puerto Rico. Anticipate Resistance. During crisis situations, you must anticipate some resistance. It’s human nature for people to look at other options if they have them. In Texas and Florida, some residents chose to stay in their homes to wait out the storm. They discovered that was no longer an option and were eventually rescued and evacuated. On the island of Puerto Rico, there were no such options…only to wait out the storm in the safest place possible. Bring Mobile Devices to the Rescue. The use of mobile phones and social media channels opened up communication more quickly as long as communication towers were in operation. People were able to send out an electronic SOS and also could locate people who needed rescuing more quickly. In times of great devastation, however, lack of electricity makes it improbable or impossible to communicate through any electronic channels. You must then revert to more traditional communication channels, like person-to-person. Be Timely. Leading up to a disaster, every minute is precious because your message must reach the public post haste, whether it is to take cover or to evacuate. Following the aftermath of a disaster, the use of time shifts to the Number One priority: saving lives. In the case of Puerto Rico, there was not enough attention given to the distribution of life-saving food and water. Many lessons will be learned from that terrible devastation. Have a Plan B, C, and D. In disasters of epic proportions, relief and rescue workers must make decisions quickly and shift to trying something different. If Plan A doesn’t work, go to Plan B; if that doesn’t work, go to Plan C, then D, and so on. In times of great emergency, you must think of absolutely every potential outcome and be prepared to act swiftly. The clock keeps ticking. Possessions can be replaced; human lives cannot. When you are faced with a crisis, draw upon past experiences and apply those teachings to the situation at hand. Hopefully the lessons learned from these recent natural disasters will help leaders better handle crisis communication in the future. With companies adopting a more casual dress code, some workers are becoming more casual about their grooming habits. Personal hygiene lies at the very center of a professional image. It’s not just the clothing that is worn; it’s what’s underneath it all. If you work with someone who needs guidance, initiate a confidential conversation to reinforce the message that good grooming habits have a positive impact on career growth. Good grooming habits begin with basic cleanliness and continue with maintenance of one’s body and clothing. 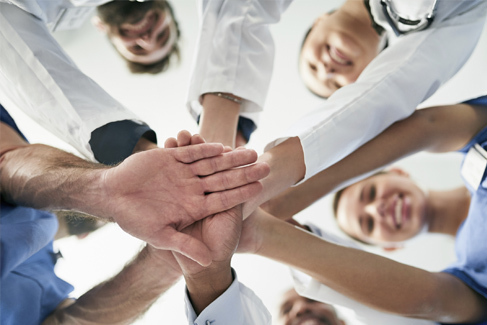 With your team member, do a quick mental scan right now, from head to toe. Body Health: Hair. Skin. Nails. Teeth. Clothing/Outer wear: Clean. Pressed. Stain-free. Also consider shoes, cologne, accessories, jewelry, and make-up for women. What’s your final assessment? Bad Teeth. During one of my recent presentation skills seminars, a man in his mid-40s, delivered his presentation with his shoulders rounded, head down, with little eye contact, no smile, and weak vocal delivery. When I shared my observations during our private one-on-one evaluation, he opened up and confided in me that his teeth were really bad, that he was embarrassed, and that he was finally going to the dentist to have them fixed. I felt sad and happy at the same time; sad that he had waited many years to fix his teeth, sad that he may have missed some promotions or better job opportunities along the way, and happy that he was finally doing something about it. Interpersonal communication is a vital part of your life and career, so invest in basic dental care to enhance your image. Heavy Cologne. 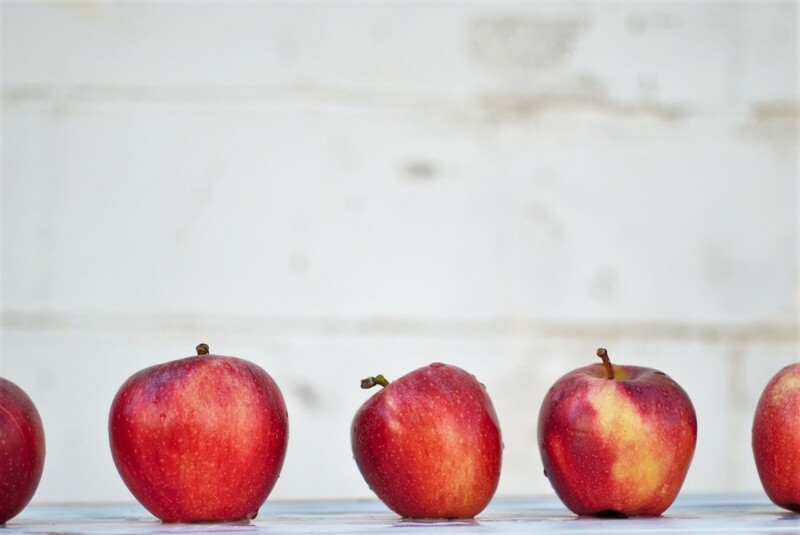 Years ago, when I served on a selection committee for a new hire, there was one applicant who stood out, and she didn’t stand out for the right reason. Her cologne reached the conference room long before she did. By the time she arrived, the entire room was filled with a strong musky scent. It was a short interview, and she did not get the job. Over-use of a fragrance can completely shift first impressions. More companies are initiating a fragrance-free work environment because strong fragrance can create unpleasant surroundings. Clean Yet Stinky. Years ago, I worked alongside a new employee who was delightful and hard-working. It was her first job. Everyone loved her enthusiasm, accuracy and efficiency. Yet we noticed one thing: Her body odor. We asked the oldest woman of our group to have a conversation with this young woman. We felt the news might be better received if it came from a wise sage. This was the right choice. When the news was shared, it was revealed that, although this young woman bathed daily, she wore her clothes several times before cleaning them. That meant that all of the oils from her body, along with perspiration odors, marinated in her clothing. When she put dirty clothes back on her body, it was as if she never bathed. After the conversation, she returned to the office like a new woman. From that moment on, her body and her clothing were clean and fresh. An added bonus: The conversation and the shift in personal hygiene boosted her self-confidence. Be kind. Whatever information you share, demonstrate respect and kindness; do not be judgmental. Share specific feedback. “May I offer you some feedback about your personal style?” Once a response is given, add “I have noticed that…” “Are you aware of that?” Wait for a response. Avoid saying “Several people have mentioned to me” or “We have noticed” because you want to ensure that you are building trust in your relationship. Ask for feedback. See how the person is receiving the information. Receive feedback without judgment. “Now that I have shared my thoughts with you, what are you thinking?” Wait for a response. Keep the conversation going. When you initiate a private conversation about a delicate topic like personal hygiene and grooming, you are deepening the level of trust with that other person. Keep the lines of communication open. A confidential conversation like this, when it is shared with kindness and concern, can transform another person’s life and offer new career possibilities. As a professional, your actions represent not only you…they also represent your company. You are a brand ambassador when you work with customers, speak at a national conference, or volunteer in the community. You are the brand, and all it stands for. You are the face of the company. One false move, like bad behavior, can stunt or end career success. The recent United Airlines debacle demonstrated that actions speak volumes about who you are and what you value. The United Airlines Flight 3711 incident, which occurred on Sunday, April 2, has been reported, analyzed and picked apart by the media, bloggers and regular folks like you and me. Here’s what happened: The flight was fully booked, and passengers were already seated. One passenger, Dr. David Dao, had been asked to relinquish his seat (which he had paid for) to make room for a United employee. He refused. As a result, Chicago Department of Aviation officers swooped in with brut force, handcuffed and carted Dr. Dao off the plane. In the process, his nose and a few teeth were broken. A video captured by another passenger immediately went viral. The rest, as they say, is history. In fact, it was an historic event. It didn’t have to be this way. A moment of thought before taking an action would have resulted in an entirely different outcome…a more positive one…for everyone involved. Know what your brand stands for. Your brand is that one thing that represents who you are and what you stand for. 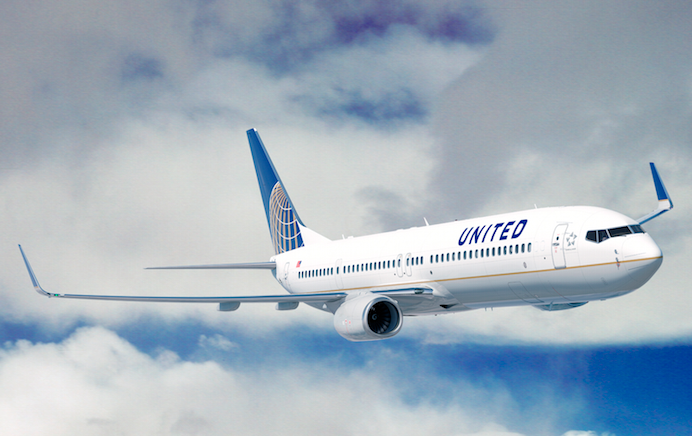 First, United’s brand begins with its name, United. That one word creates a larger-than-life image of the company. What does United stand for? Second, you may or may not remember United Airlines’ famous tagline, “Fly the friendly skies.” Because of the brut force that was used to remove Dr. Dao from his seat, one might question, “Is United really friendly?” If United’s thought leaders had really, well, thought about this, they may have come to the conclusion that the action that was being considered didn’t fit with the United brand. But things didn’t play out that way. Every employee of United is a brand ambassador for the airline. And every employee of the Chicago Department of Aviation serves as a brand ambassador for the organization. Do the right thing. Consider the public’s reaction once the video went viral. It was clear that everyone agreed that the situation was not handled properly. We have all been in situations where our gut screamed out to us “Don’t do it!!!! !” Yet, we ended up not listening to our intuition and lived to regret our poor choice. When your conscience speaks, listen. If protocol is flawed, pitch it. “I was just following protocol” is not a good enough reason. Sure, United Airlines had a policy. All airlines have policies, procedures and protocol. Sometimes you need to look at protocol, look at the situation, consider the outcome, and ask if the protocol fits the situation and if the outcome is one you desire. If things don’t add up, it’s time to re-examine the protocol or throw it out completely in that situation. The incident has resulted in United Airlines changing its policy. Take quick, responsible action. The leadership at United Airlines first offered a boilerplate response to the media, saying they were examining what had happened before commenting. A few days later, United CEO Oscar Munoz apologized and took full responsibility. This was too little too late. Two days after the incident, United’s stock had fallen by 4%, roughly $1.5 billion. Although the stock has regained some of its strength, United will carry this ding on its record forever. Build a culture of respect and compassion. You will never find yourself in an awkward situation or have to apologize for bad behavior if you treat every person that you meet with respect and compassion. More people recognize that this is the best way to move forward together. The United Airlines incident is already becoming an important case study for business schools, communication scholars, human resource professionals and enforcement officers. Hopefully this is one case where we will learn from mistakes and bring about positive change as brand ambassadors.